We’ve been very busy over here lately, as this week I helped organize and run our elementary school’s Kindergarten Orientation (so fun!) 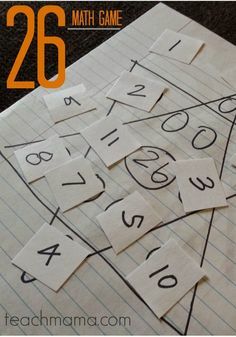 and I have been trying to get myself ready for the theMom 2.0 Summit in New Orleans this weekend (so exciting!). 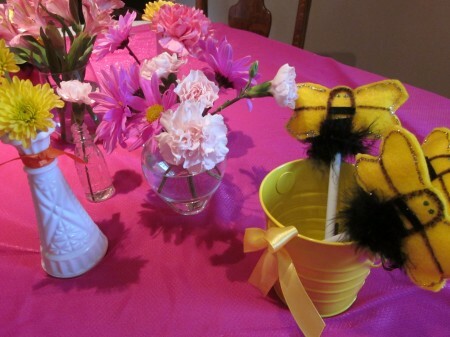 But I’ve wanted to share how we made Cora’s bumblebee birthday a buzzing success, so here we are: the skinny on how we made sweet bumblebee wands, bumblebee pens, bumblebees for our hair, and played bumblebee games. All to ring in our Cora’s big #4. 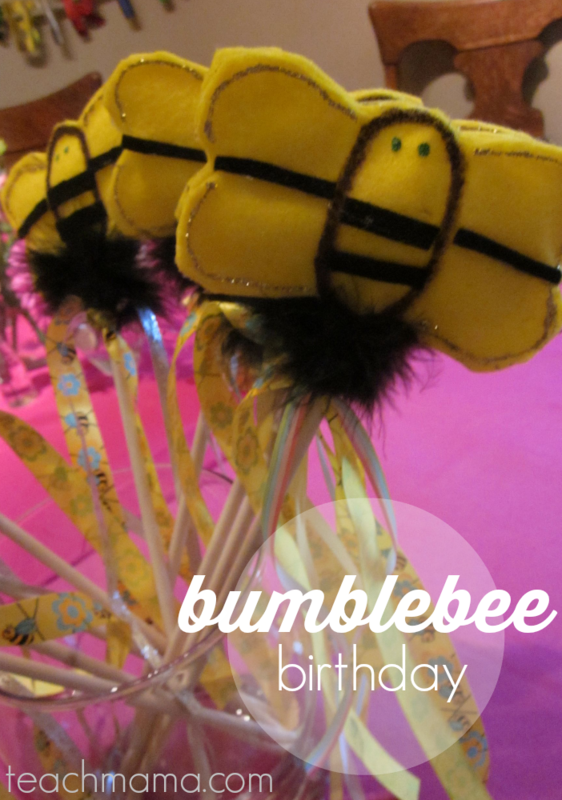 After a ton of research, we’ve got a boatload of bumblebee birthday ideas: bumblebee wands, pens, games. 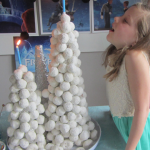 We had bumblebee cupcakes–of course!–that were a huge success, but the wands and pens brought smiles to her teeny-tiny playdate party pals, too. 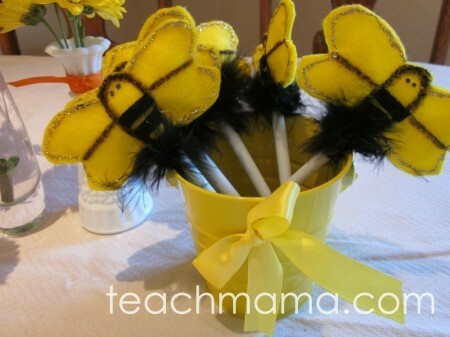 Bumblebee Wands: Cora’s fantabulous preschool teacher gave her a bumblebee wand at Halloween because Cora dressed as a bumblebee. 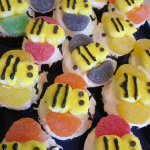 It also marked the day that Cora needed to have a bumblebee birthday party (her birthday was still five months away–) with bumblebee cupcakes, bumblebee wands, and bumblebee games. The bumblebee pens actually were made for her family party–we thought that the large number of boys who were part of our ‘family’ party might prefer a bumblebee pen to a bumblebee wand (which would have probably morphed into a bumblebee sword or poker). How PRETTY are these bumblebee pens!? 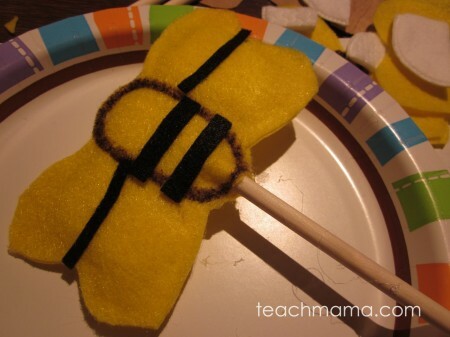 S0 I basically copied the bumblebee wand that Cora’s teacher gave her. I started with a bumblebee patterns which can be downloaded here as a pdf. 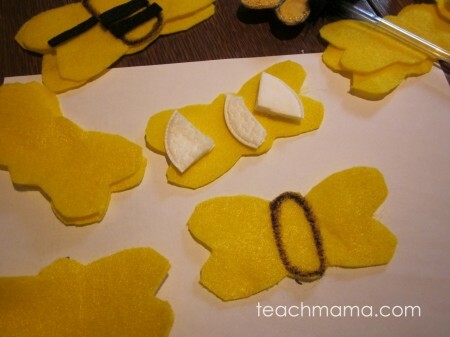 Then I copied it onto yellow felt, cut out two pieces–for a front and a back–and outlined the bumblebee body with a black Sharpie. 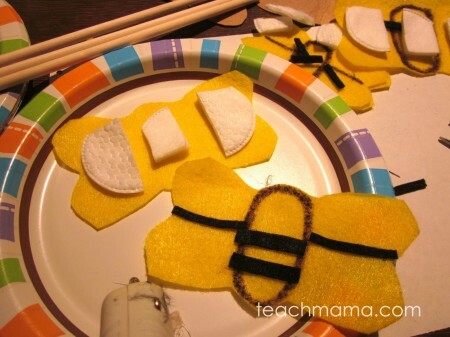 I cut out small black stripes out of black felt, and the bumblebee body was born! Bumblebee pens are in the works! 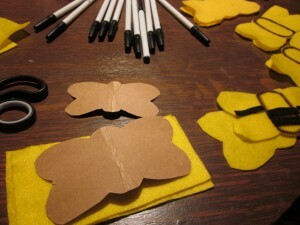 To fluff up the bumblebee, I cut small pieces of a flat cosmetic pads (the kind that you can buy at the drug store). Then I hot-glued the two pieces together, leaving a small opening at the bottom where I shoved in the top of the pen. I glued the pen inside, and then the fun began. First, I cut a small piece of a skinny black feather boa (found at the craft store in feather section) around the base of the bumblebee body. Then I outlined the bee in gold glitter, adding blue glittery eyes. They turned out cuter than cute, and the kids loved them! 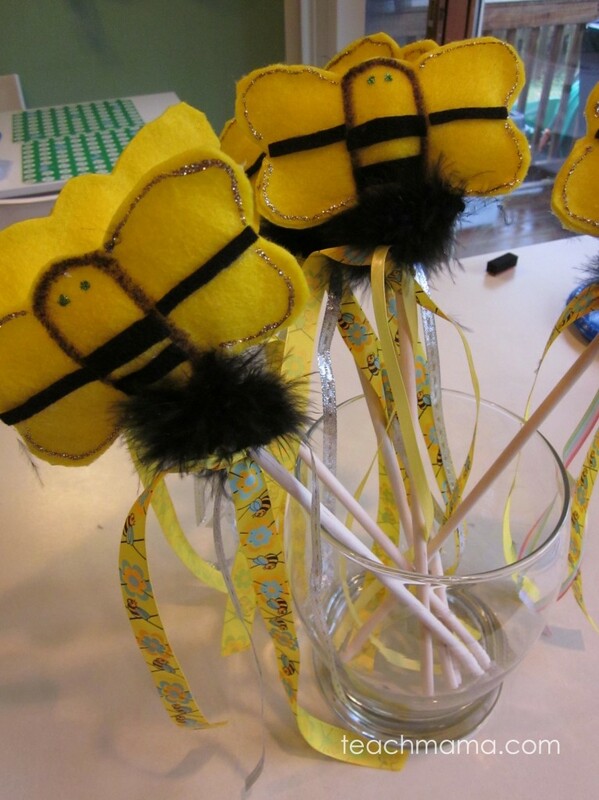 Making the Bumblebee Wands was very similar, except that in place of the pens, I used thick wooden sticks (a la craft store). 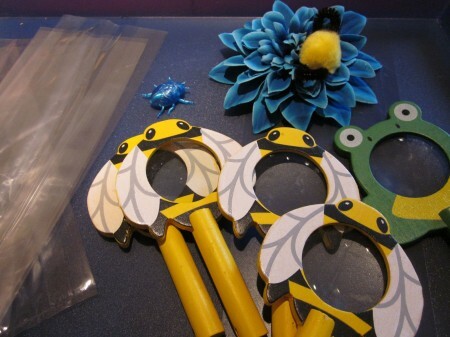 I also used a Larger Bumblebee Pattern for the wands (see below) and cut bigger pieces of the ‘fluff’ for each one. The bumblebee patterns can be downloaded as a pdf if you’d like. 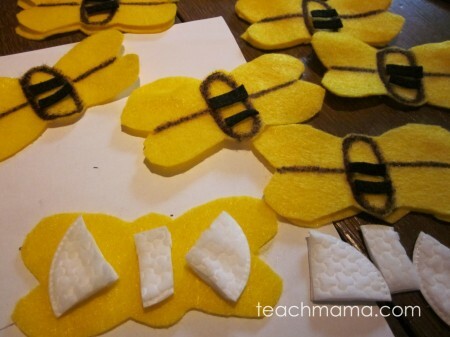 Since the wands were larger, I also divided the bumblebee wings with black felt to break them up a bit more. We also tied pretty ribbon on the wands–two different types–to make them look more fluttery and fancy. 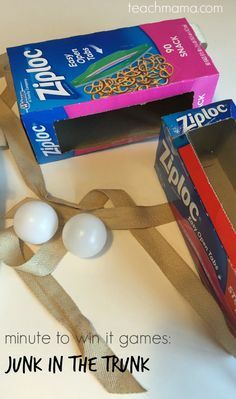 I love the bumblebee ribbon, but you could totally use white satin mixed with a simple pattern ribbon, and it’d look awesome. The bumblebee wands were ready to be cut. . .
. . . filled with fluff. . .
. . . and decorated with some glitter and feathers! For Cora’s little playdate party, we needed a bumblebee game. 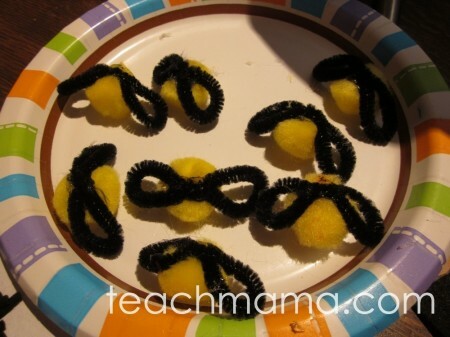 So we made teeny pom-pom bumblebees out of yellow pom-poms and black pipe cleaners for the game, Find the Bumblebee! Each kiddo got a tiny bumblebee magnifying glass and a plastic bag. 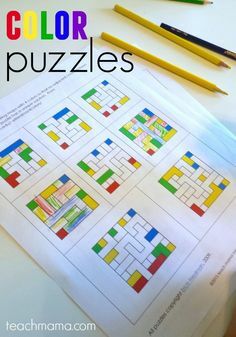 The instructions mirrored the game name–Find the Bumblebee--and that’s what they did. We hid tons and tons of not-so-scary plastic bugs in our playroom along with about 10 bumblebees. The girls used their magnifying glasses to become little bumblebee detectives, finding as many bees and bugs as they could. Because Cora only really wanted to have a teeny party with three preschool friends and that was it, that’s the only game we planned and played. 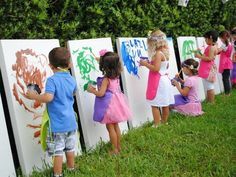 The girls played freely with dress-ups, the bugs, the playset, and each other–and it was honestly one of the most fun parties ever! Things don’t have to be huge and wild and crazy to still be a lot of fun, especially for our little guys. 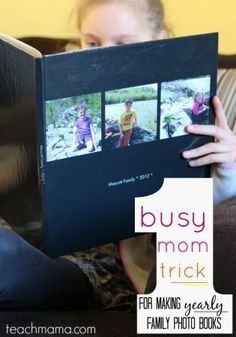 I know it’s easier said than done when the crafty possibilities seem endless–but something that makes sense so that we, as parents and party-planners, don’t go insane. 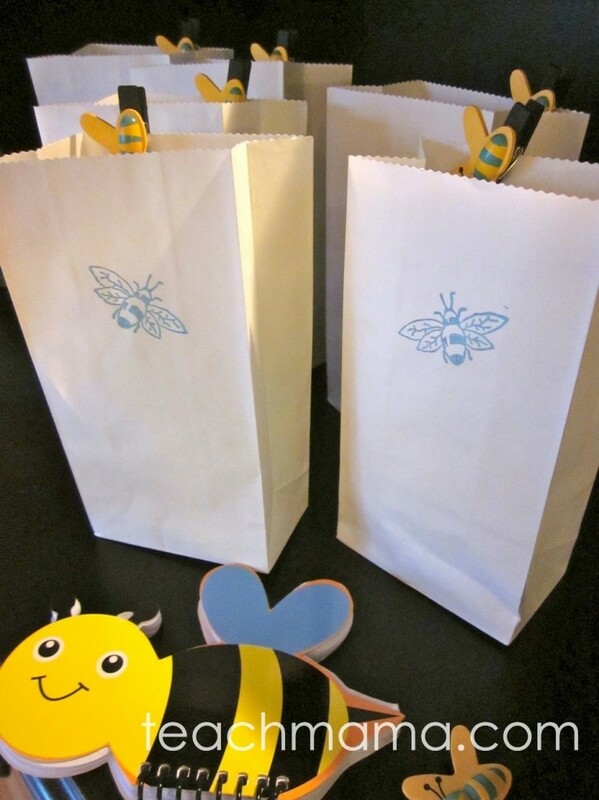 We put bumblebee wands and pens and tiny tablets in simple white bag (stamped with a bumblebee, of course!) and containing flower pins/ barrettes with a bumblebee glued on. The girls snacked on bumblebee cupcakes, marshmallows, and sweets, and my littlest bee was a happy, smiley new-four year old! Many, many thanks to Cora’s super-awesome bumblebee preschool teachers for making her year so fantastic that she not only wanted to be a bumblebee for Halloween but also have a bumblebee birthday party! Woo-hoo, good teachers are the BEST! I didn’t know our little #3s were so close in age! Sydney will be 4 on May 1. Thanks for all the great ideas! I think I will adapt the bumblebee search for Sydney’s Pinkalicious party. How about find the cupcake? Too fun! Amy!! I love it–you’ll have to tell me how the Pinkalicious party goes, my friend!! Your parties are so awesome! I need your help! My firstie turned 7 yesterday, but is having her party a week from tomorrow. It’s at home with 3 school friends. She wants a mystery party in which there needs to be a mystery solved. Everything we’re doing so far has been her idea, but I have no idea how to come up with a mystery…maybe the cupcakes can go missing? I’m sure she could help with this part, but I’d like for it to really be a mystery for her as well. For the invitation, we hid the party info. on the card with teeny tiny letters and sent a magnifying glass decorated with ribbons to help read it. All her idea. 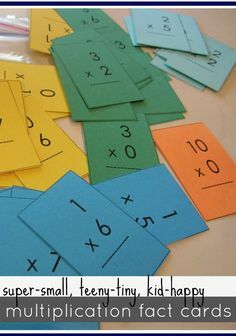 Then, one of our crafts is to decorate a plain white small notebook….this is to be where they write the clues/suspects down. Another craft will be fingerprint art (you know…to go with finding fingerprints at the scene of a crime). They will also get a canvas bag to decorate to keep their detective tools in. Each of these things (including the magnifying glass) will be the goody bags. She also wants each girl to have a Nancy Drew book for the goody bag because her reading about a million of those is what started this whole mystery thing in the first place. Have your daughter check out the newer Nancy Drew and the Clue Crew. Great for their age! Any ideas what I can do for the mystery? I’m pretty sure I could give clues/poems for them to figure out the next place to go…but she really wants it to be actual physical evidence that may point to one suspect but by the end they figure out it was really someone else. I can’t do it! And you are so stinking creative! 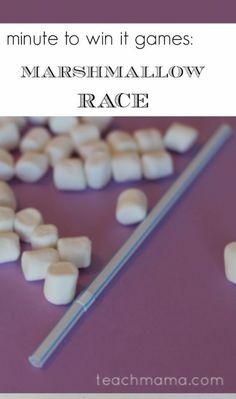 Oh my gosh, Brandy that sounds like so much fun!! I’m no party-planning expert, but I always think it’s funny to involve stuffed animals and pets. How about a favorite stuffed animal loses her hat/ purse/ collar? And there’s a fluffy culprit, too–a stuffed bird who loses feathers along the way? Who took the purse without asking? Who was playing dress-up with a hat but forgot to ask? Let me know how it goes, my friend! !